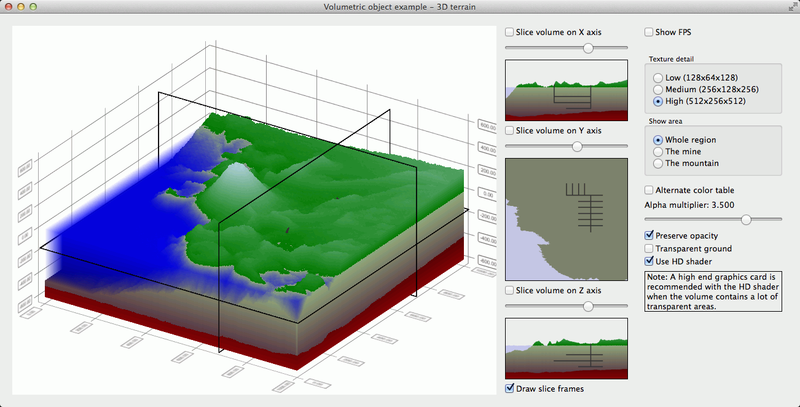 This example shows how to use QCustom3DVolume items to display volumetric data. We use eight bit indexed color for our texture, as it is compact and makes it easy to adjust the colors without needing to reset the whole texture. For the texture data we use the data we created earlier based on some height maps. Typically the data for volume items comes pregenerated in a form of a stack of images, so we are not going to explain the data generation in detail. Please refer to the example code if you are interested in the actual data generation process. The QCustom3DVolume::alphaMultiplier is a general multiplier that is applied to the alpha value of each voxel of the volume. It makes it possible to add uniform transparency to the already somewhat transparent portions of the volume to reveal internal opaque details. This multiplier doesn't affect colors that are fully opaque, unless the QCustom3DVolume::preserveOpacity property is set to false. By default the volume rendering uses the high definition shader. It accounts for each voxel of the volume with correct weight when ray-tracing the volume contents, providing an accurate representation of even the finer details of the volume. However, this is computationally very expensive, so the frame rate suffers. If rendering speed is more important than pixel-perfect accuracy of the volume contents, you can take the much faster low definition shader into use by setting false for QCustom3DVolume::useHighDefShader property. The low definition shader achieves the speed by making compromises on the accuracy, so it doesn't guarantee each voxel of the volume will be sampled. This can lead to flickering and/or other rendering artifacts on the finer details of the volume.